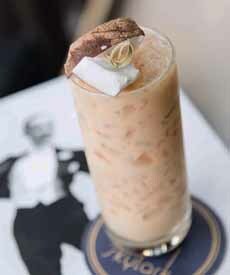  Iced coffee with spiced rum and coconut liqueur. You can use any liqueur you like (photo courtesy The Skylark | NYC). 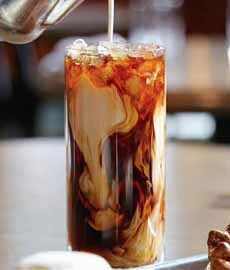 Here’s how to turn your iced coffee into an after-work drink or a weekend tipple. The inspiration comes from from The Skylark, a cocktail lounge in Midtown Manhattan with panoramic views of the city. Combine the first four ingredients, stir, and garnish as desired. DON’T HAVE RUM OR COCONUT LIQUEUR? While spiced rum is a natural with iced coffee, you can use plain rum; or experiment with other spirits.